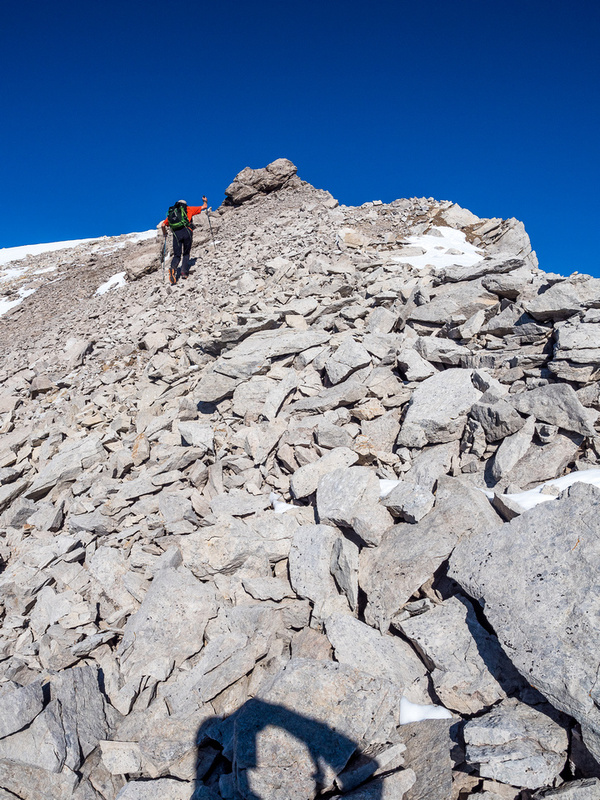 Difficulty Notes: The highest peak of Pipestone Mountain is easy scrambling. We also tagged the labeled peak which we called “Pipestone Towers” which was slightly harder. 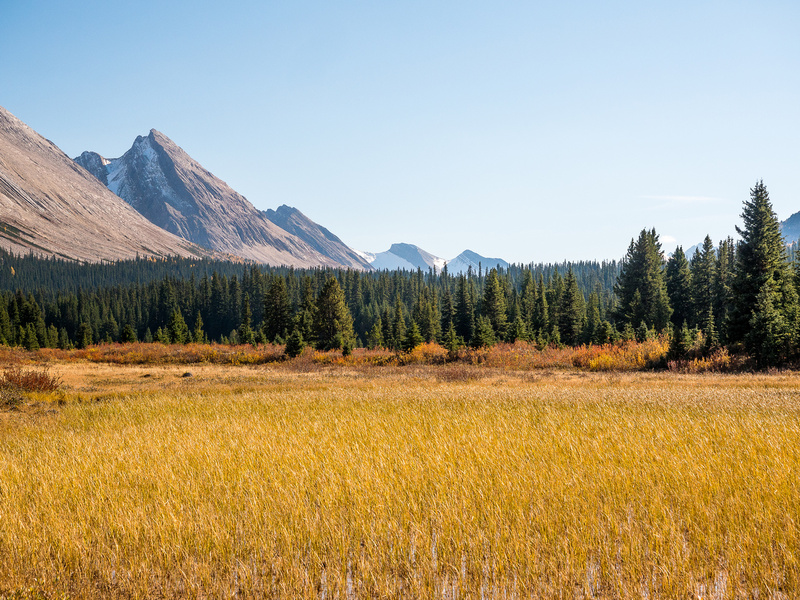 Naming: The mountain is said to have taken its name from the Pipestone River and Pipestone Pass and. At the head of the river, green and red shale was soft enough for the Indians to make pipes out of it. Official name. Other names Mount Macoun. 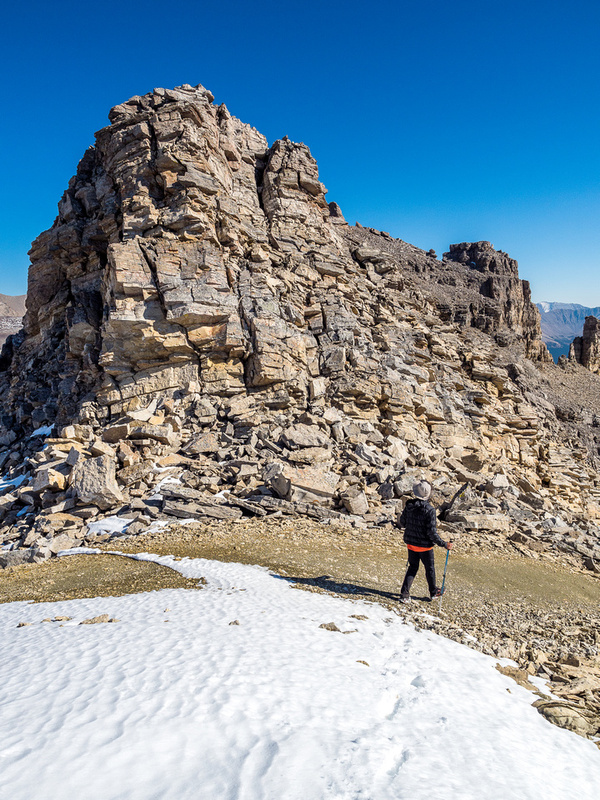 When Phil Richards and I set about to scramble Pipestone Mountain, we didn’t realize the confusion involved with knowing where the true summit was! The high point is certainly not the labeled one on modern maps, but the official elevation of 2971m is certainly the high point – not the labeled one to the SE. As a result of the confusion, we named the high point “Pipestone Mountain” and the labeled, lower one, “Pipestone Towers”. 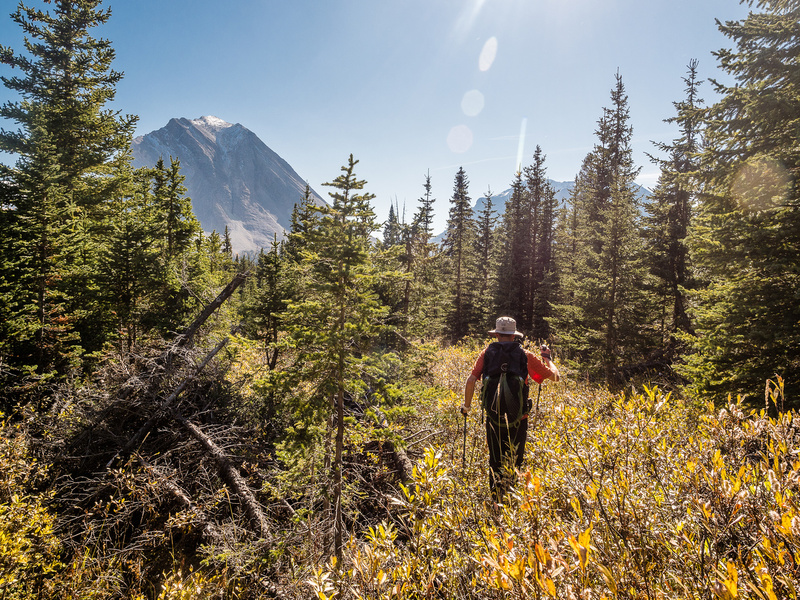 We backtracked our steps along the Red Deer River towards the south end of Pipestone Mountain before turning off trail to our right and starting a relatively short bushwhack to an obvious SE gully running down the south end of the mountain. This gully is not visible from the trail, but clearly visible on Google Maps, which is where I’d scouted out our proposed route ahead of time before transferring it to a GPS route. Of course, the view from space made this gully look a bit less bushy than we found it to be up close and personal. After ditching most of our gear near the start of the gully, we continued through some low shrubs and nasty, small Christmas trees before finally finding the proper center of the gully and continuing our ascent in a rocky drainage which quickly steepened and became perfect for an efficient ascent. 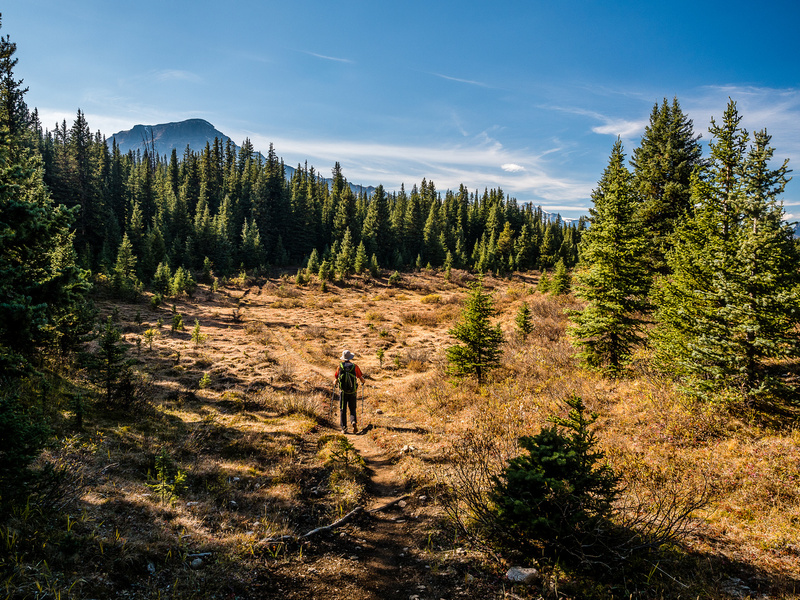 We gained height very quickly in this terrain, I had a hard time keeping up with an energetic Phil who’d already traveled more than me when he collected samples from Douglas Creek that morning. The ascent gully narrowed and then widened again and the terrain was never as steep as it appeared. 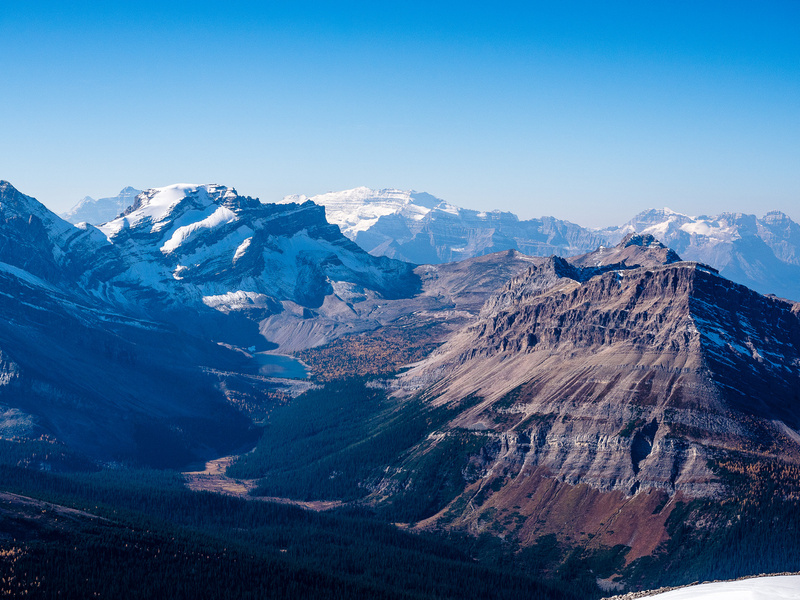 Looking back over the Red Deer Lakes with Skoki Mountain above and Fossil at left. As expected, our views on Pipestone were similar to the day before on Cyclone, but with slightly different angles and lighting, due to the different time of day. The upper mountain to the false summit wasn’t nearly as steep as it looked from below, and we easily followed the ridge. It was depressing to realize how far we still had to go from the false summit, but just as on Drummond and Cyclone it wasn’t actually as bad as it first seemed. 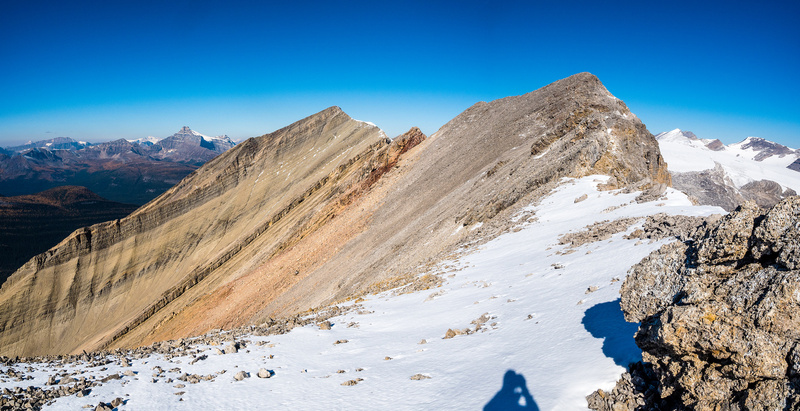 Soon we were enjoying another fantastic summit panorama in perfect fall conditions. Unfortunately (for us), we didn’t even find a cairn on the summit of Pipestone Mountain, much less a register! This meant we’d have to ascend the SE towers to see if there was something official stashed there. From the summit, the towers looked blocky but fairly easy. We also deduced that there was no way they were over 2900m. There are worse ways to spend a Friday morning in late September. 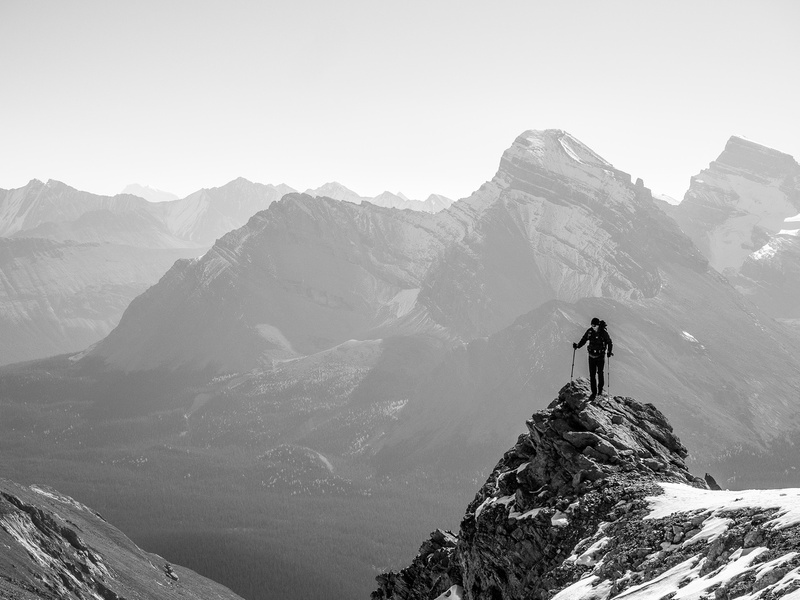 Phil takes in the Drummond Icefield from the summit of Pipestone Mountain. 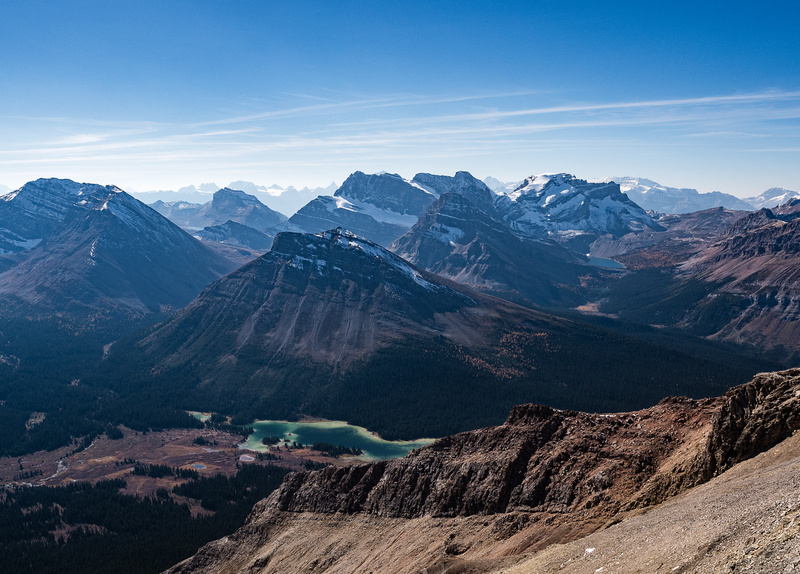 Ptarmigan Peak at left, Victoria Peak at distance over Merlin Lake. After ascending the highest point on the Pipestone massif, very clearly much higher than the SE (labeled) towers and near or at the officially listed height of 2970m, we were disappointed with the lack of a register, or even just a cairn. We knew Rick Collier had been there in 1992 and he almost always places a register, but we searched high and low in vain for it before giving up. The only thing to do was ascend the SE towers and see if there was any evidence of official records buried there. From the col with the high point, the towers looked pretty easy, although there was some concern about the final summit block. We dropped our packs and started up the ridge on blocky, very loose terrain. Quickly it became apparent that while they looked easy, the towers were going to be our scrambling crux of the trip. We did manage to keep things at a moderate level, but the looseness of the terrain was concerning nonetheless. 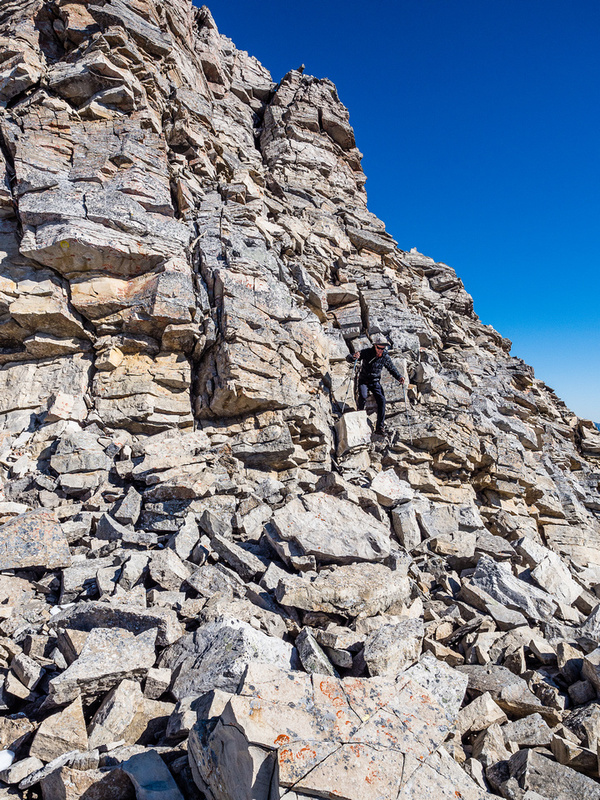 We tried to avoid any difficult terrain on climber’s right, but eventually we gave up with the tricky traverse and just ascended to the ridge top and proceeded to the summit along it. The west end of the highest tower was fairly steep and somewhat exposed but eventually we found ourselves at the highpoint on the SE towers with a small cairn awaiting our inspection. Alas, no register here either! I remembered a trip report from Mike Warren in 2007 where he mentions standing on this summit as part of a ski traverse trip. 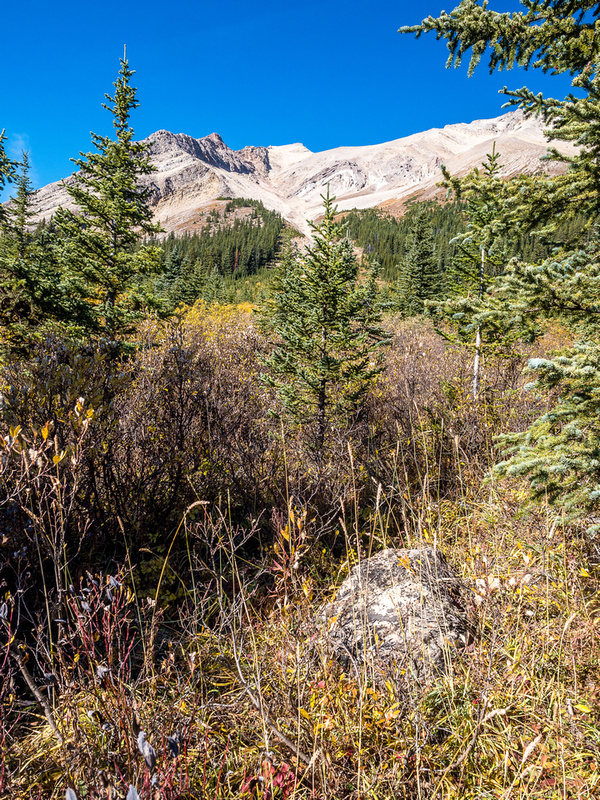 He also assumes in his report that the highpoint is the true summit – not the towers. Perhaps it was his party that built the small cairn? We decided we agreed with Mike’s assessment and hence the separate naming of “Pipestone Towers”. 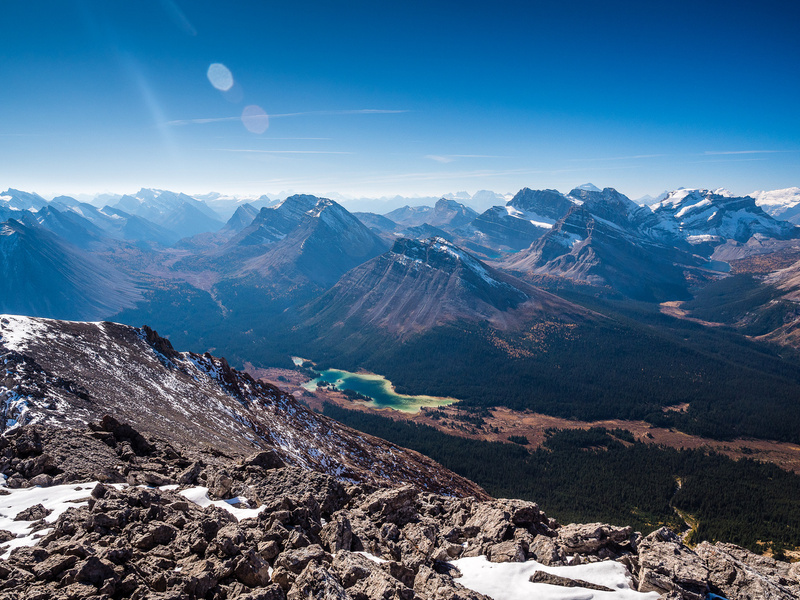 Views over the middle Red Deer Lake towards Mount Douglas, St. Bride, Lychnis and Tilted Mountain. 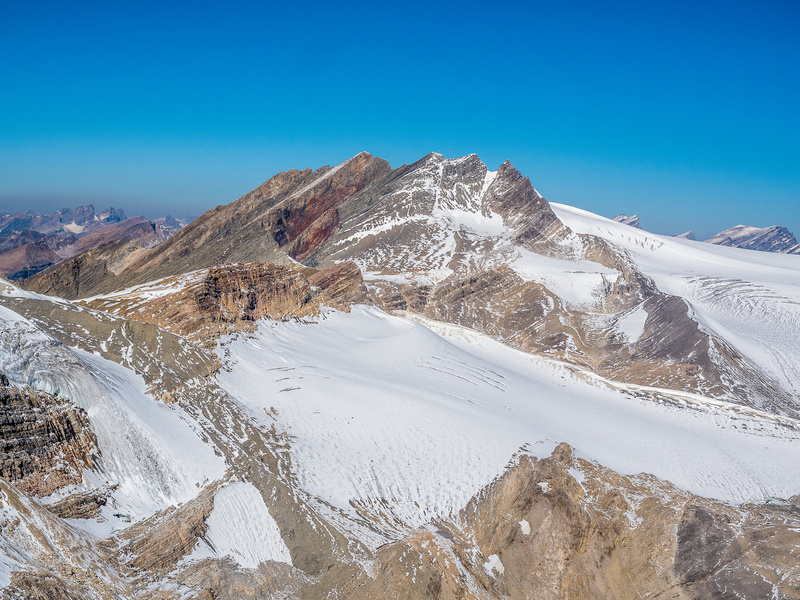 All the main Skoki summits visible at left and center including Douglas, St. Bride, Lychnis, Tilted, Oyster, Anthozoan, Fossil, Redoubt, Skoki, Ptarmigan, Wall of Jericho, Pika, Richardson and Merlin Ridge. 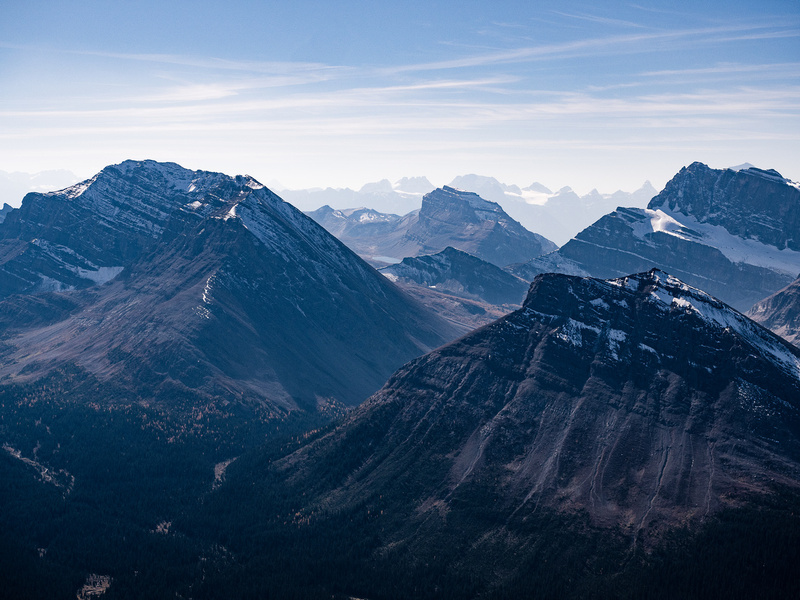 Pipestone and Cyclone Mountain at left and Drummond at right with the Drummond Icefield in between. 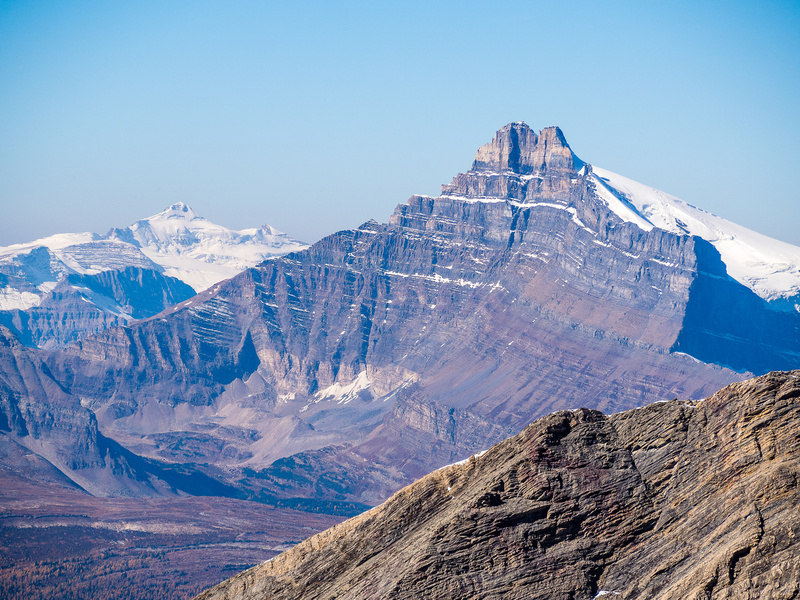 The Mount Drummond Massif to the east of Pipestone Mountain. After taking a few summit photos, we descended the east end of the tower which was easier than the ascent line we took up the west end. We also stuck closer to the ridge crest on return, rather than side sloping around the blocks and towers. 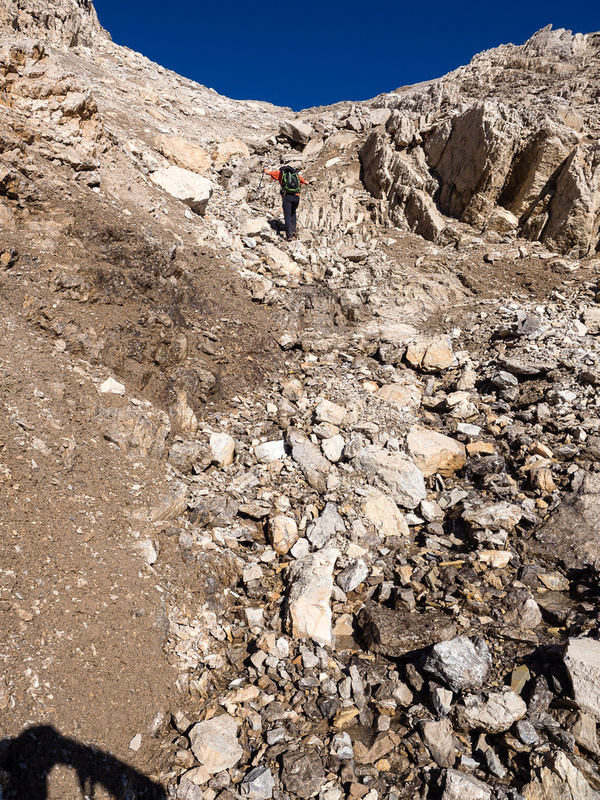 We descended some pretty steep and loose terrain – definitely the most scrambling we did on this whole trip and justifying some delicacy and care. 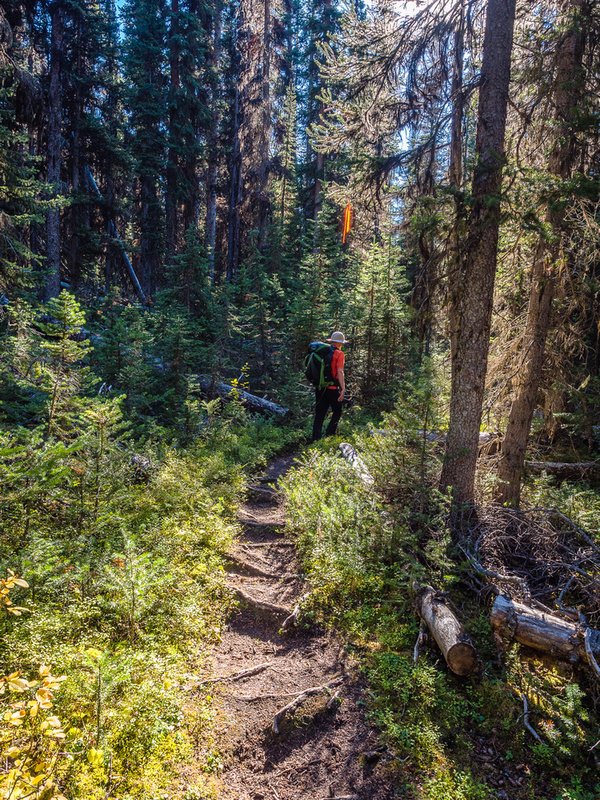 After getting back to our gear at the col, it was time to descend the long gully to treeline. Our ascent had been very efficient on ledges and firm rock, so how fast would our descent be? It turns out – pretty darn fast! 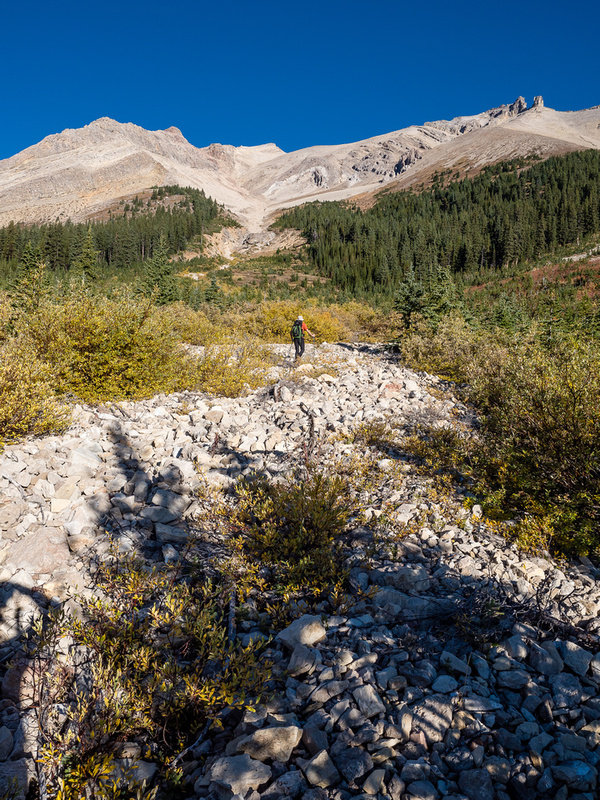 Pipestone is one of those rare mountains that happens to have loose scree right beside the firm ascent gully which greatly sped up our descent. We went from the col to our gear below in about 45 minutes! 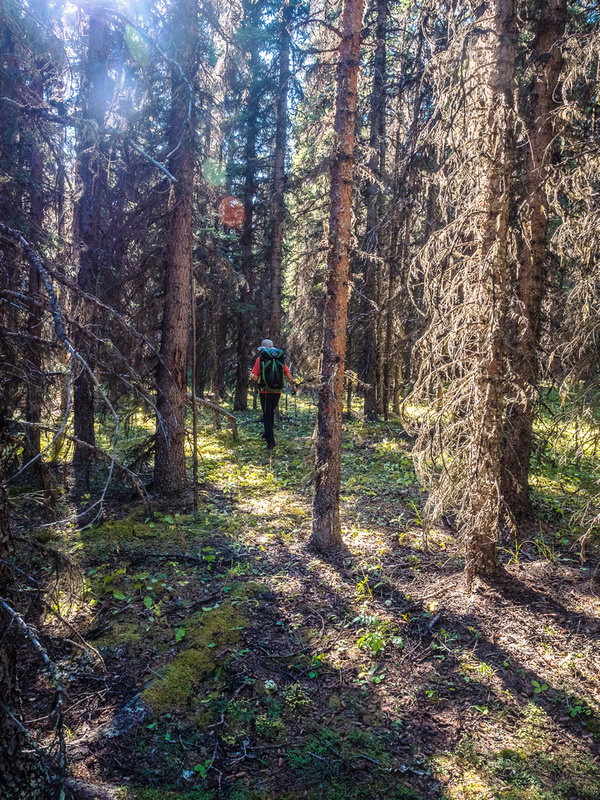 It was still 14:30 by the time we finally joined the Red Deer Lakes trail and continued on towards the largest Red Deer Lake where Phil would collect his final soil sample. Phil comes down the summit ridge. The rest of our trip was a bit more muddled than I would have preferred, to be honest. 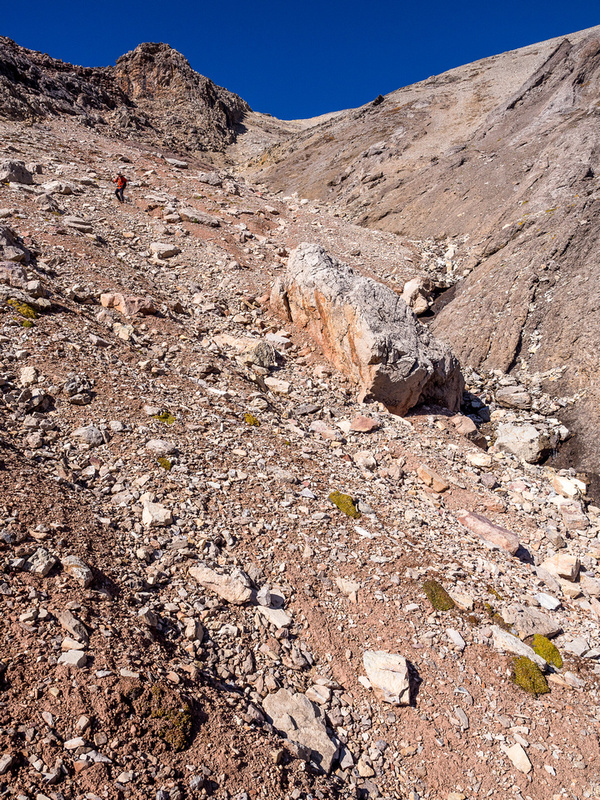 We spent the rest of Friday doing a lovely traverse from Red Deer Lakes to Merlin Lake via a trail running south of Little Pipestone Creek, over the NW ridge of Skoki Mountain. This trail was not marked on our ViewRanger map. I realized at this point that I should still bring at least a photo of the map along as ViewRanger’s Landscape map was WAY OFF on all the trails we followed from the largest Red Deer Lake all the way up to Merlin Lake. Pipestone to Merlin Lake detail Route Map – note the routes marked on the base map but not actually there! We originally had some plans to scramble and take photos around Merlin Lake, but the weather moved in overnight on Friday and ruined them. 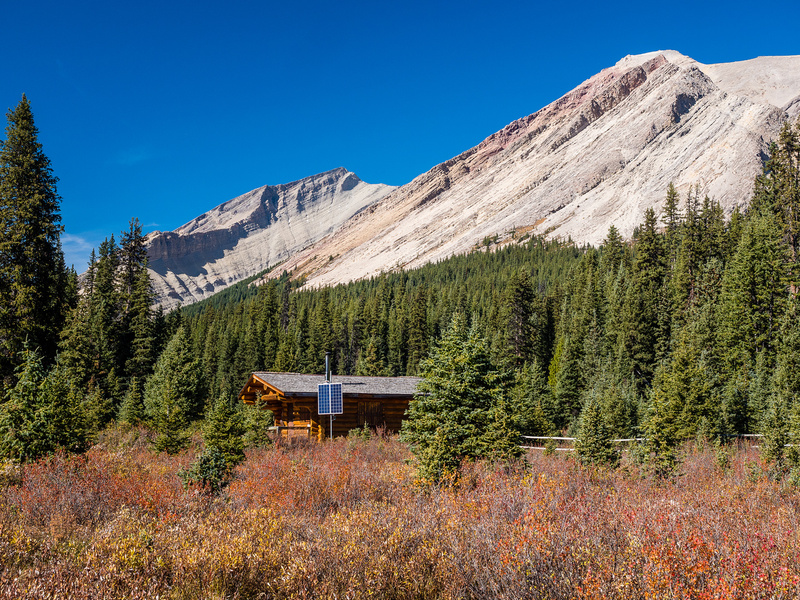 As it turns out, it didn’t have to, but we had no idea what the forecast was and rather than wait out the pouring rain at 04:00, we packed up and left the Skoki area very early on Saturday morning. On hindsight this was disappointing and we should have waited as the rain stopped and only clouds remained – a lesson for next time I suppose. 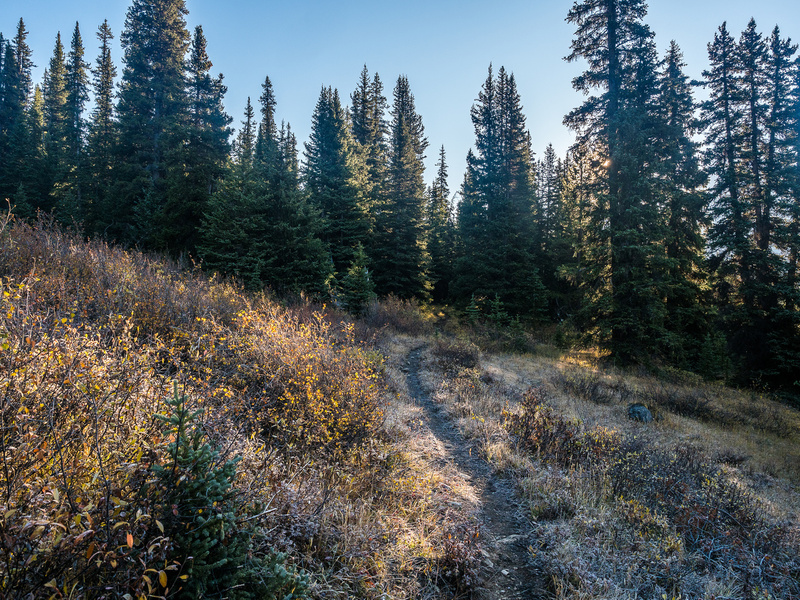 In one pretty intense moment, I uncapped my bear spray and was ready to do battle with some Grizzlies in the dark when we spotted animal eyes moving towards us on the pitch black trail early in the morning! We were grateful to spot some rather tame deer behind those eyes before engaging the spray. 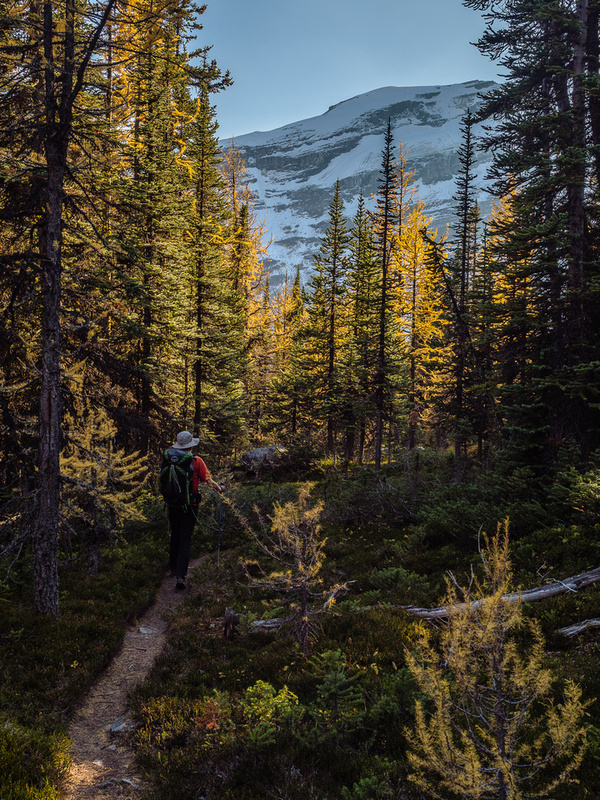 We enjoyed the Skoki Lakes even though the larches were past prime, before quickly descending Boulder Pass to our waiting bikes. Another gorgeous day as we approach the bottom of the gully. 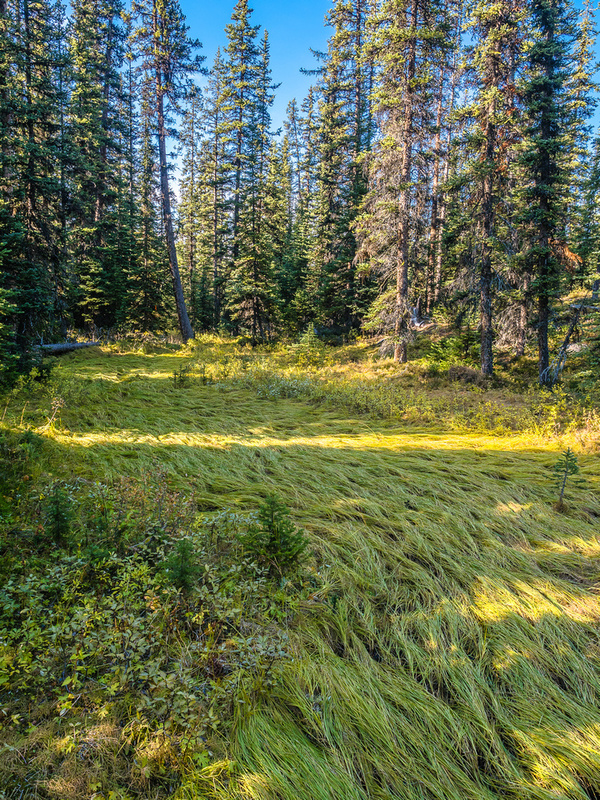 A good trail leads along the south edge of Little Pipestone Creek from the largest Red Deer Lake. Very pleasant late afternoon fall hiking up to Merlin Lake with the Wall of Jericho rising above. 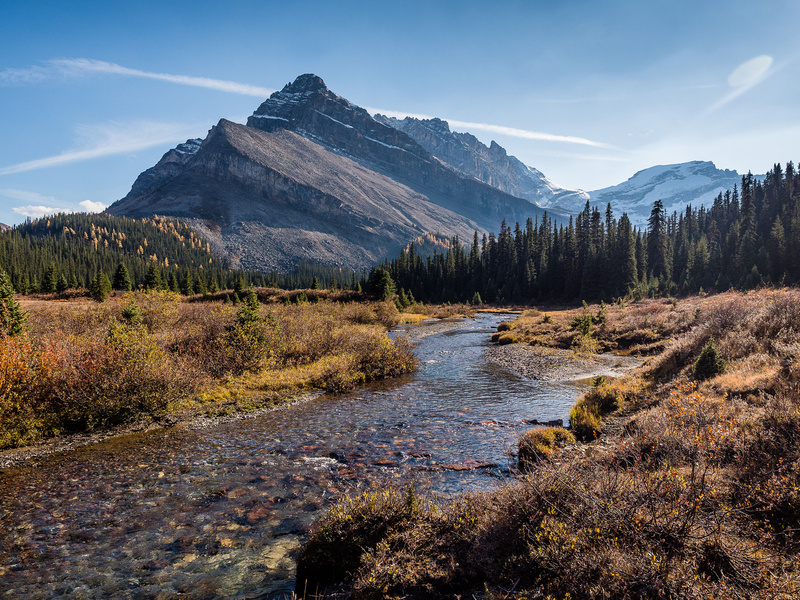 Overall, I really enjoyed this 2.5 day outing in Skoki during prime fall hiking season. 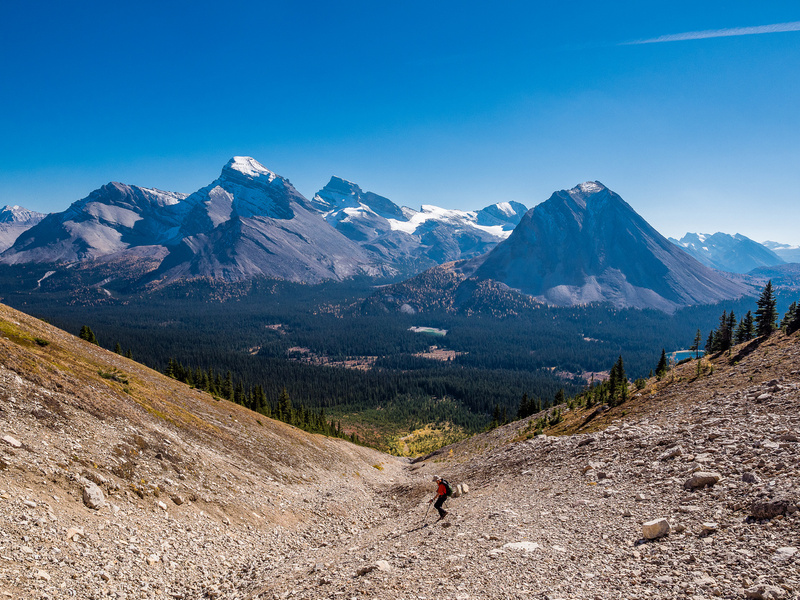 As usual, Phil and I covered a lot of kilometers and a many hundreds of meters of height gain accessing some of the more remote Skoki peaks. 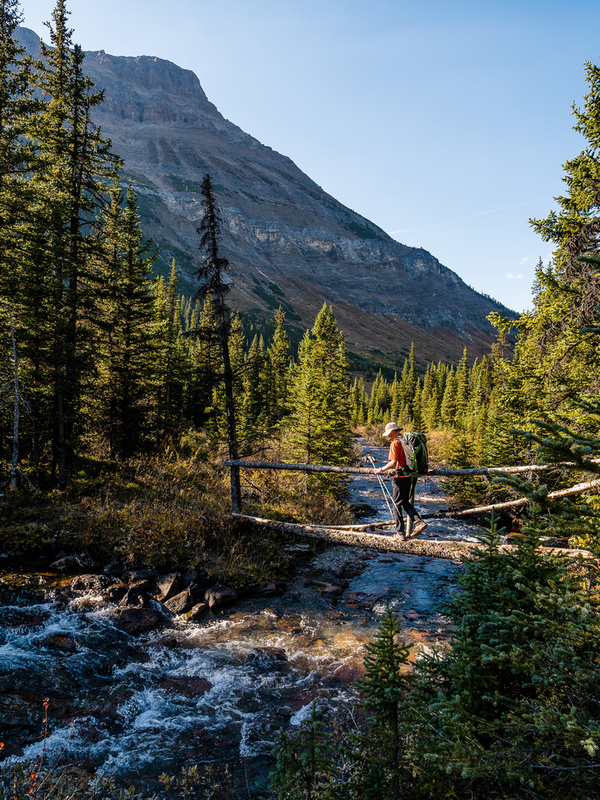 Pipestone and Cyclone should be on every peakbaggers list as they are near a good backcountry campground (Red Deer Lakes) and are very easy to ascend. The fact that they have mind blowing views in all directions should improve their low ascent numbers. The vegetation around the trail is frozen solid this morning. 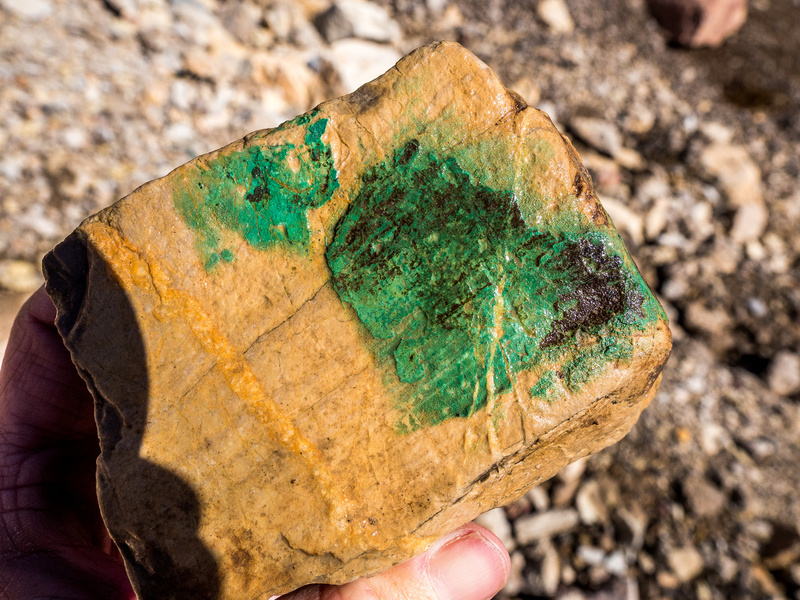 A very green coating on this rock. Not paint. Looking back down the huge SE gully towards the Red Deer Lakes. Douglas, St. Bride, Lychnis and Oyster Ridge at center. It did feel never ending at some point. 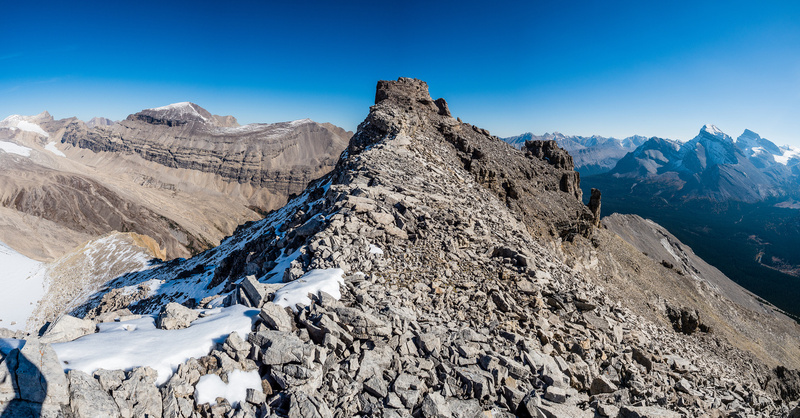 Mount Drummond, Pipestone Towers, Douglas, Oyster Ridge, Fossil and Skoki from L to R.
Looking along the impressive east face of Pipestone towards the summit from the false summit. Looking over Merlin Lake towards Richardson and Merlin Ridge (C) with Mount Victoria at distant center. 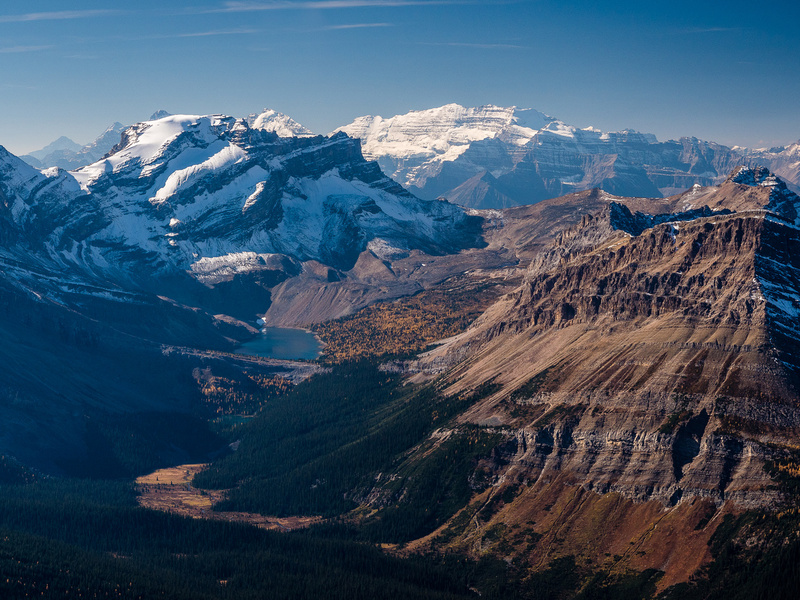 The sublime Red Deer Lakes with Fossil and Skoki rising over them and Redoubt, Ptarmigan, Wall of Jericho, Pika and Richardson in the far distance right of center. 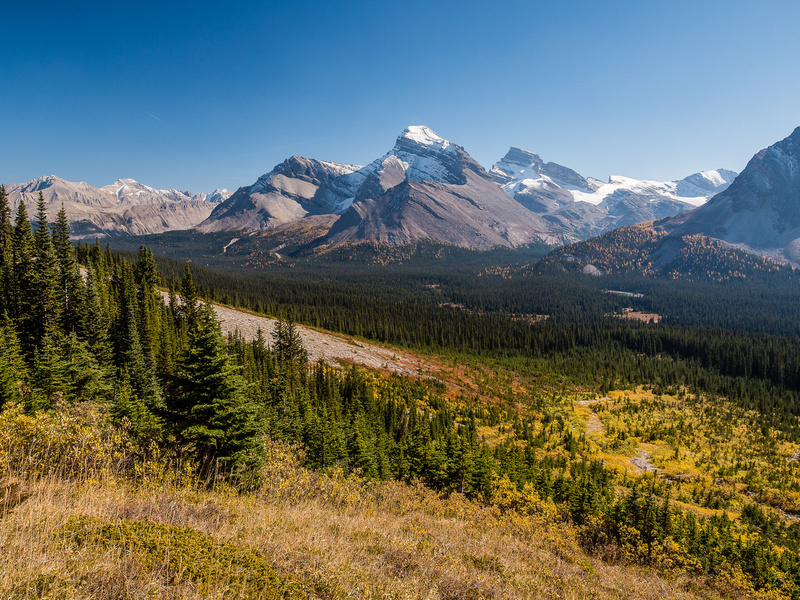 Phil enjoys great views over the Drummond Icefield towards Mount Drummond at left and the Pipestone Towers at center. Phil on the summit ridge. 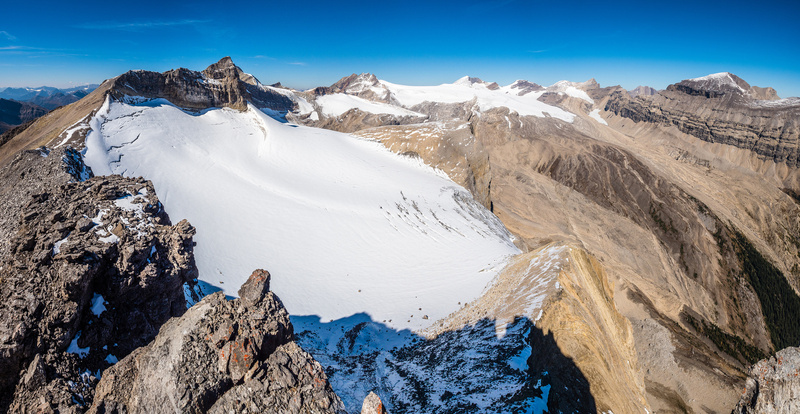 Summit views over the Drummond Icefield. Cyclone at far left and Drummond at center-right. 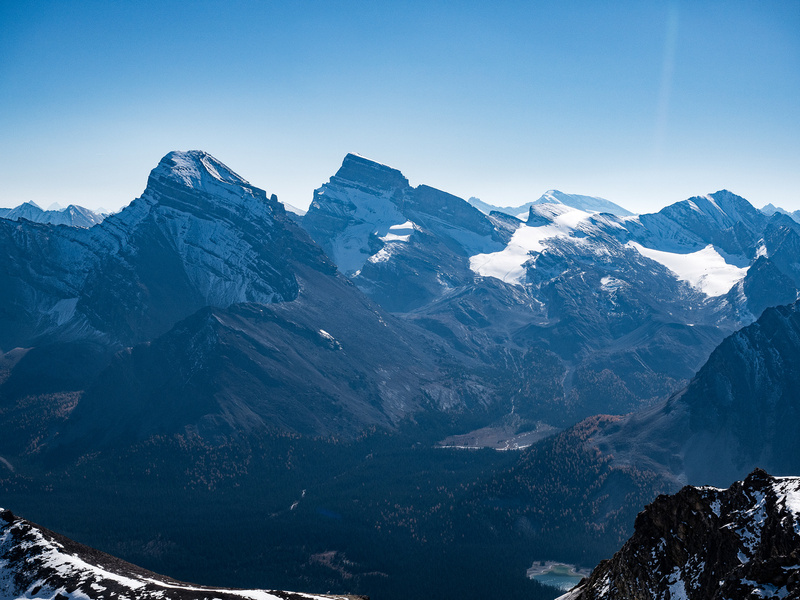 Summit views looking west towards Lake Louise. Cyclone now at far right and the false summit at left. Rick Collier also thought the traverse to Cyclone Mountain looked easy. Until he tried it. There are worse ways to spend a Friday morning in late September. 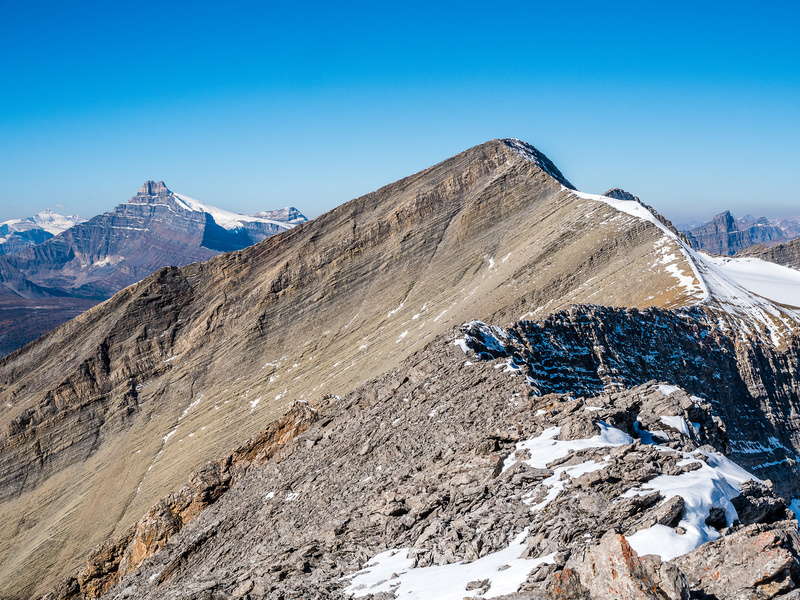 Douglas, St. Bride and Lychnis are impressive Skoki peaks that also see very few ascents. The Red Deer Lakes and early morning lighting are fantastic. Great views over Merlin Lake and past Mount Richardson towards Lefroy and Mount Victoria. Mount Daly at left with Balfour and Hector at right. The clear, early morning air allows views to faraway peaks such as The Lyells at distant left and Chephren at distant right. 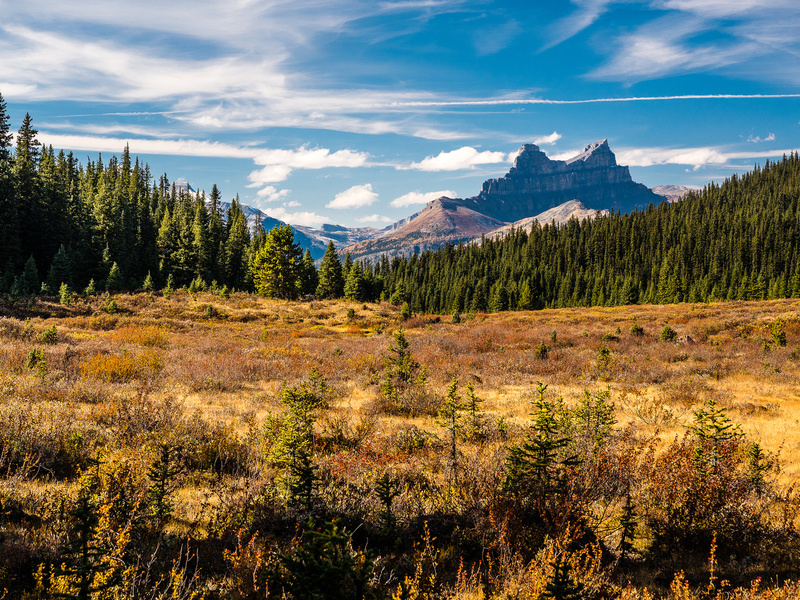 The impressive Cathedral Mountain at left and Mount Stephen at right. 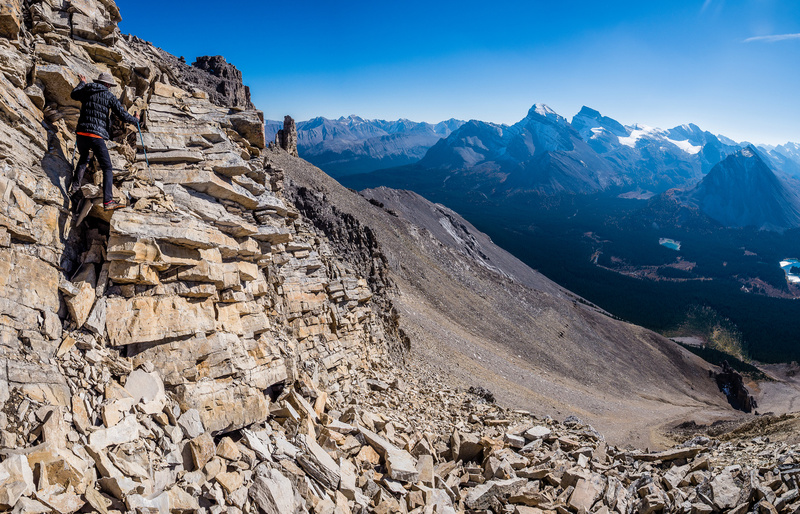 The unmistakable summit ridge of Mount Daly. Mount Carnarvon pokes over it at left. 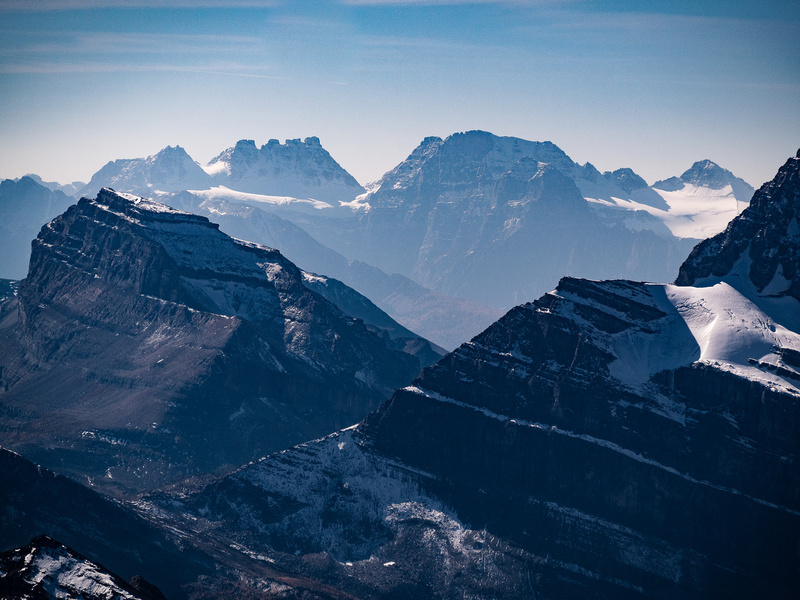 Bident and Quadra rise over Mount Redoubt at left with Mount Fay at center. 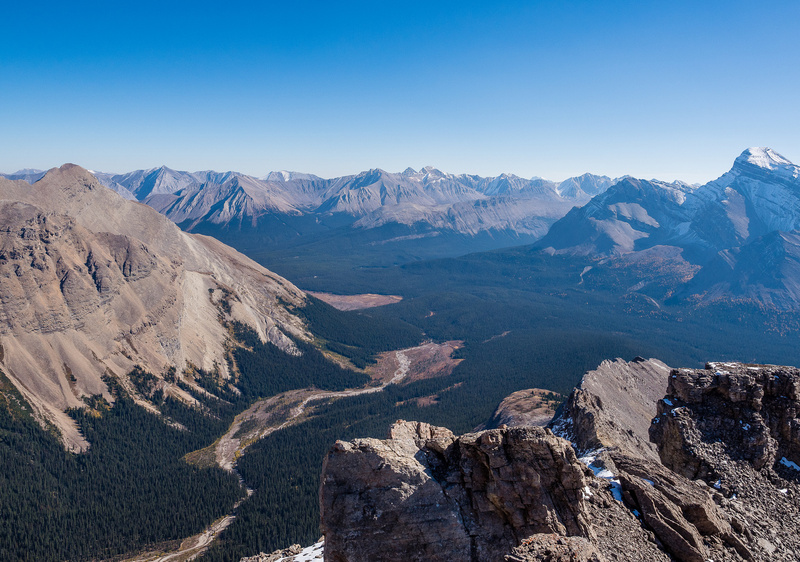 Mount Drummond is a long trip - but a relatively easy one. We put in 54km and 2800m of height gain on that one two years ago. Our ascent gully at lower right and the Pipestone Towers at center looking much easier than they proved to be. 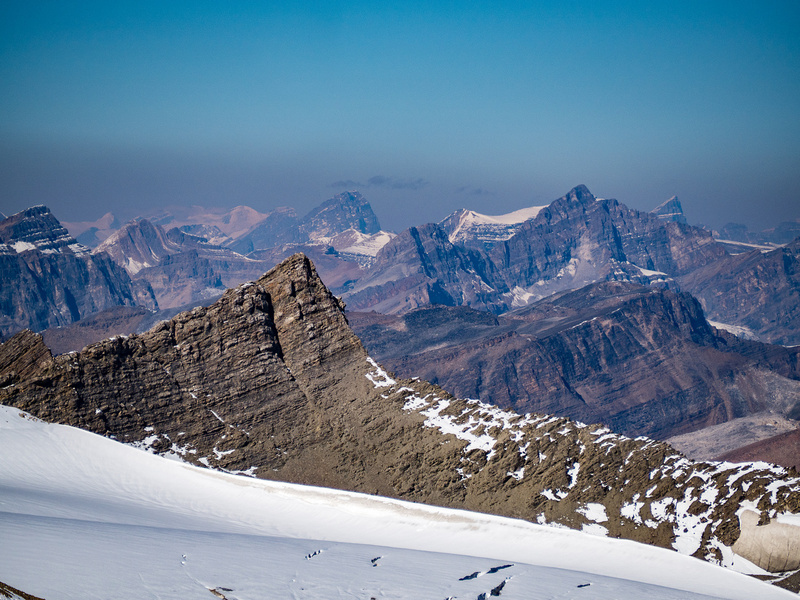 The towers are harder than they first appear, with steep crumbling rock and some exposure to the icefield below once on the ridge crest. We tried to avoid difficult terrain by going climber's right. 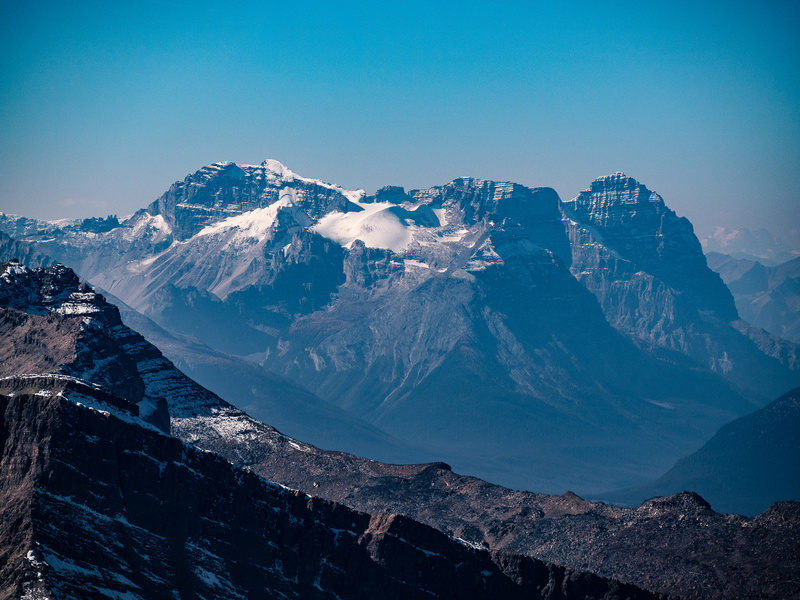 The views from Pipestone Towers are almost better than from Pipestone - the Drummond Icefield views certainly are. 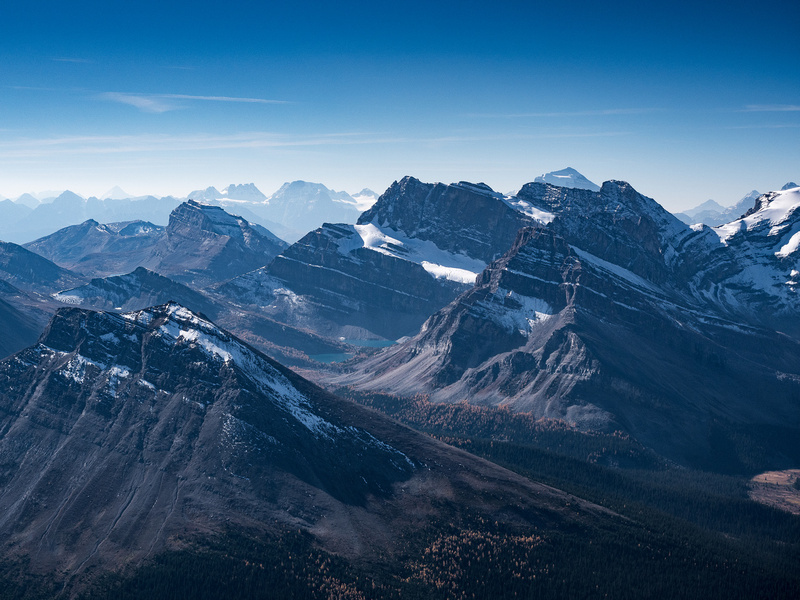 All three Red Deer Lakes visible here with Pipestone Mountain looming impressively at far right. Looking over the Drummond Glacier to Pipestone Peak. Looking past Mount Douglas (R) towards the Sawback Range and distant peaks such as Gable and Barrier in the Ya Ha Tinda region of the front ranges. 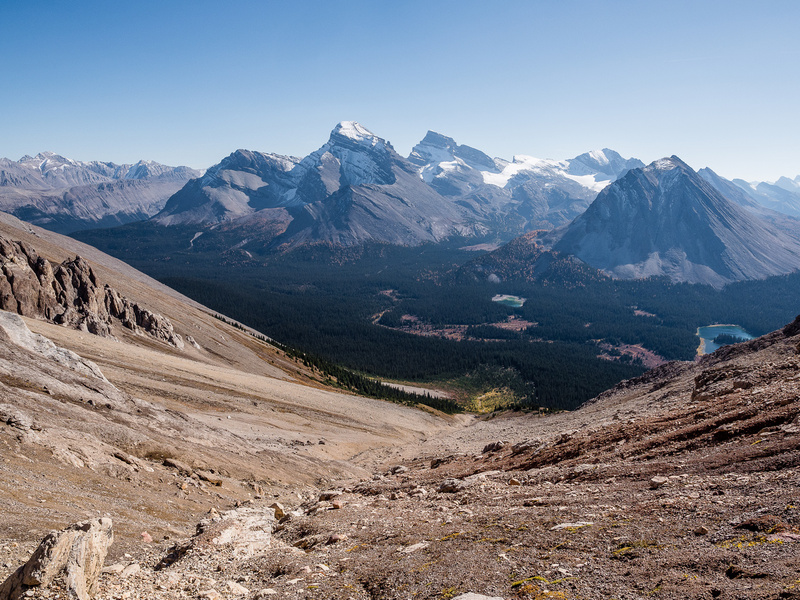 Looking in between Fossil (L) and Skoki (R) peaks over Packer's Pass Peak towards Redoubt Mountain with Ptarmigan rising at right. 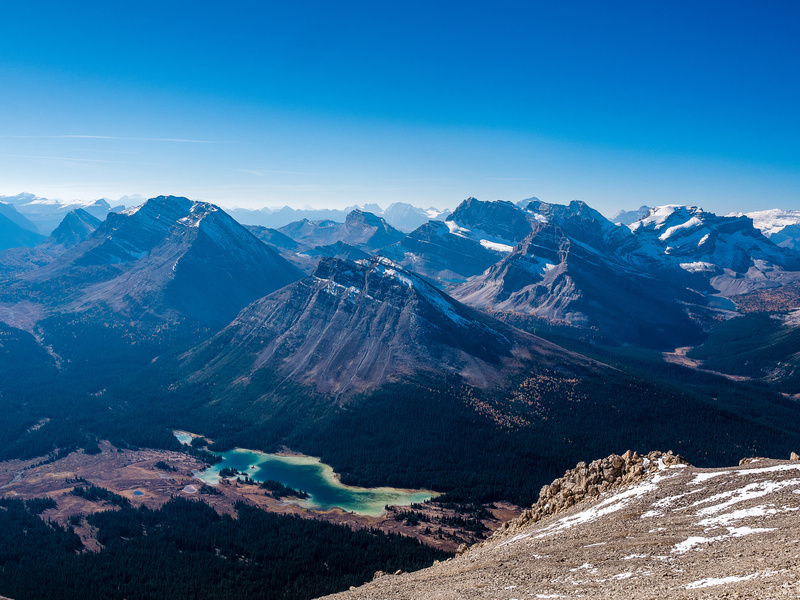 Looking over the largest of the Red Deer Lakes towards Skoki Mountain. More delicate downclimbing off the nose of this tower from upper left to lower right. Impressive views of Pipestone Mountain from the col. Descending alongside our ascent gully on the much softer ground to the right. 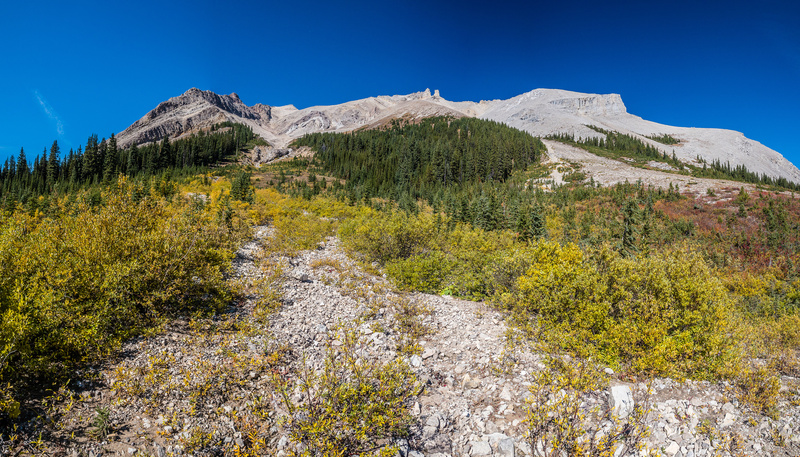 Looking back up at the Pipestone massif from the lower SE gully. 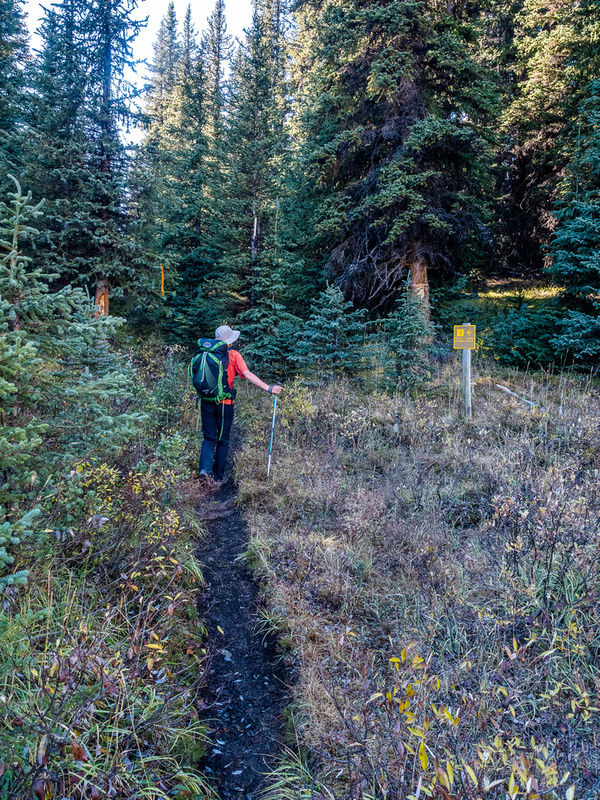 A short bushwhack to the Red Deer River trail. A last look up the long gully. An open forest made for pleasant travel back down to the trail. The warden cabin near Red Deer Lake with Cyclone (L) and Pipestone (R) rising above. A gorgeous fall hiking day around the Red Deer Lakes. 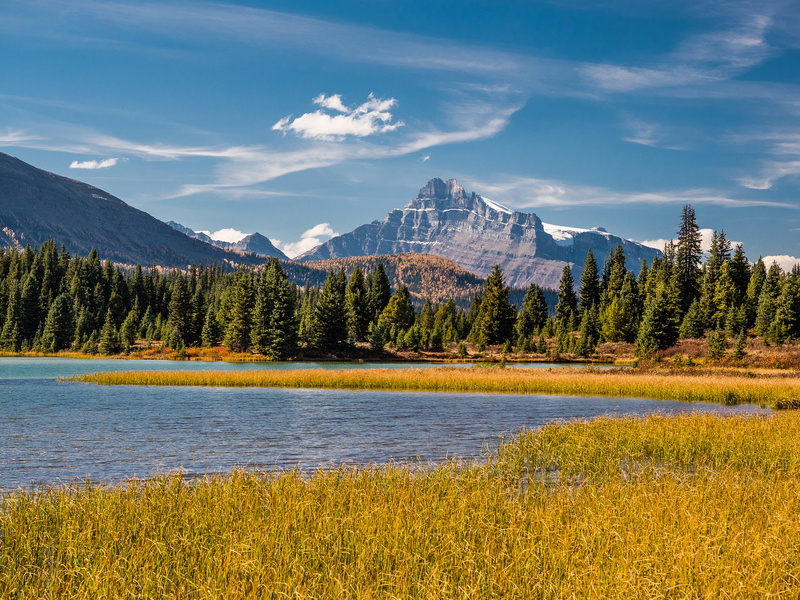 Mount Hector rises over the largest of the Red Deer lakes. A sea of fire with Tilted Mountain at left. Oyster and Douglas along with the Red Deer Lakes. 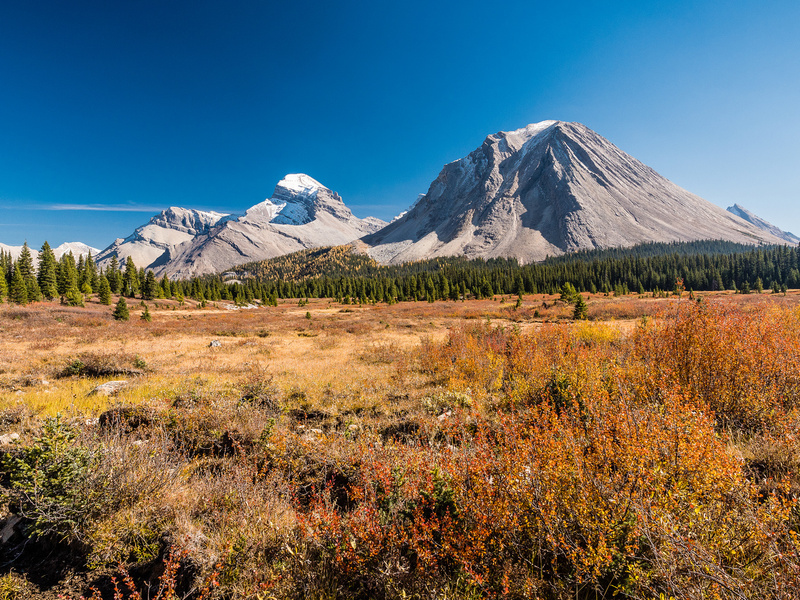 Molar Mountain rises over meadows on fire as we traverse around the NW shoulder of Skoki Mountain en route to Merlin Lake. A plethora of ribbons and even a sign tells us that we are on route towards the Merlin Meadows campground. Interesting landscapes along the trail to Merlin Meadows CG. This rickety bridge crosses the stream running out of Castilleja and Merlin Lakes just downstream of the Merlin Meadows CG. 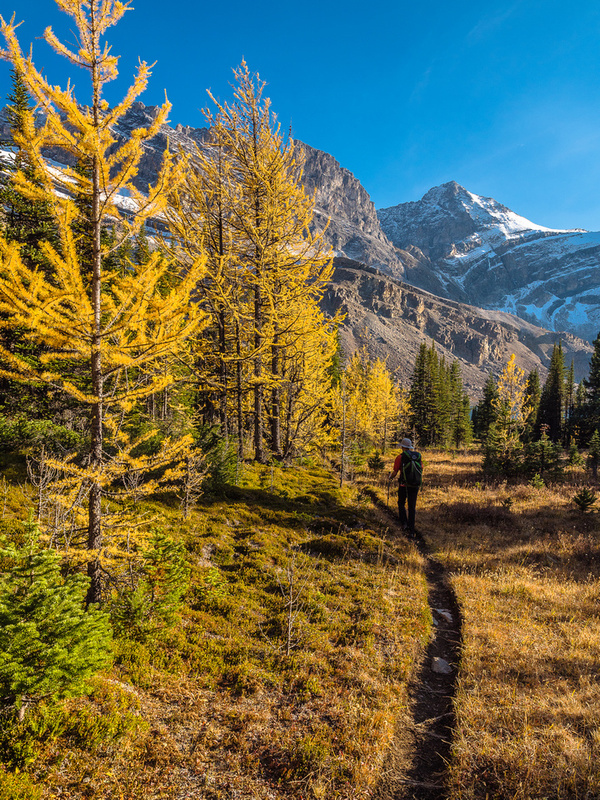 Pleasant late afternoon fall hiking up to Merlin Lake with the Wall of Jericho rising above. 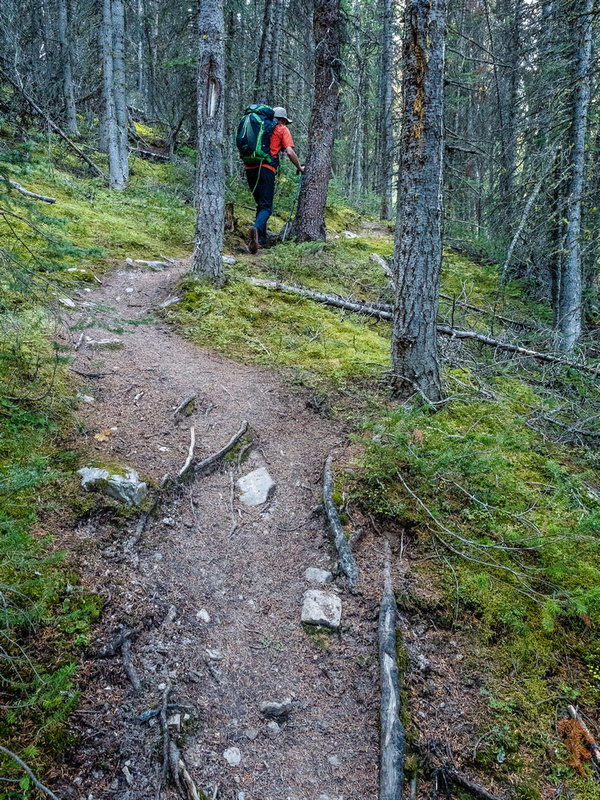 Steep forested trail to Merlin Lake. Back into larch forests as we approach Merlin Lake. World on fire as we approach Merlin Lake - just visible here at right. The Merlin Lake headwall view, looking back down over Castilleja Lake towards Cyclone and Pipestone at far distant left. A very different scene the next morning as we pass the Skoki Lakes in thick morning clouds. 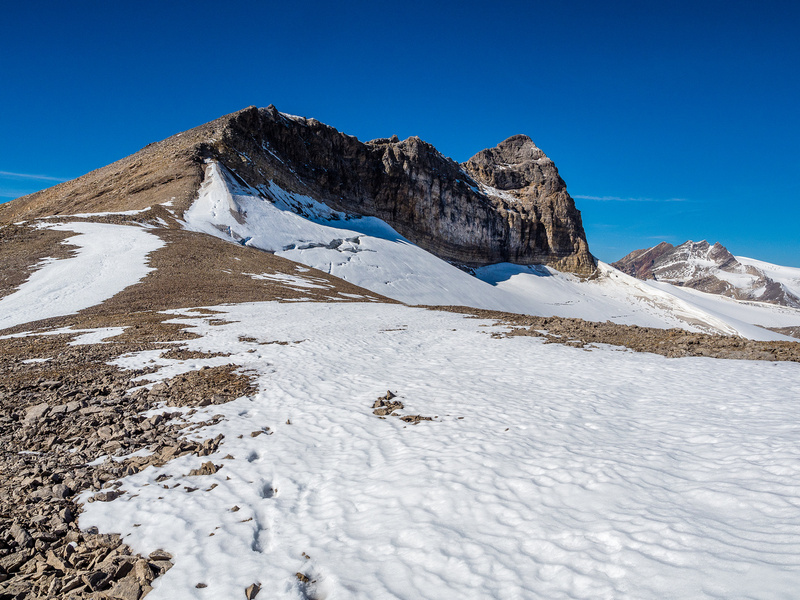 Returning down from Boulder Pass towards Lake Louise.